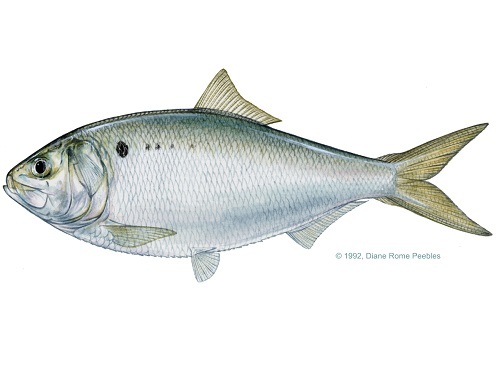 Menhaden are one of the most important commercial species for the US. They are usually targeted with purse seines and processed into fish meal and fish oil. The purse seine fishery has been in operation since the mid-1800’s and landings peaked in the 1950’s and 1980’s for the Atlantic and Gulf menhaden respectively. Landings of Atlantic menhaden have since decreased, whereas landings of Gulf menhaden have remained stable. Stock assessments are conducted by the Atlantic States Marine Fisheries Commission (ASMFC) and the Gulf States Marine Fisheries Commission (GSMFC). The ASMFC has been slow to implement measures to address past overfishing, and many of the current regulations were only recently implemented. According to the last stock assessments performed in 2015 for the Atlantic menhaden and in 2014 for the Gulf menhaden, both populations are healthy and are not being overfished. However, there is uncertainty regarding the data. Menhaden have life history characteristics that make them inherently resilient against fishing pressure. Bycatch comprises only a small fraction of the menhaden catch, but given the size of the fishery, total numbers of bycatch can be substantial. Little is known about bycatch caught, as there is minimal observer coverage and data is unreported to the public. There is concern over the bycatch of bottlenose dolphins in the Gulf. Menhaden are species of exceptional importance. This means that the ecosystem role that they play is disproportionately large compared to their biomass. Menhaden impact phytoplankton and zooplankton populations, and filter excess nutrients from water similar to filter feeders such as oysters. Additionally, the species serve as an important item to numerous finfish and piscivorous birds. Ecosystem-based management was incorporated into the Atlantic menhaden management measures.